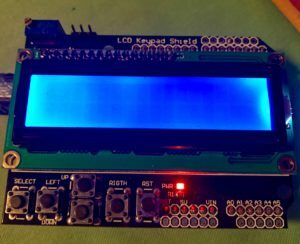 Some months back, a student at Ecole Polytechnique came to me asking for help with an Arduino shield, that he’d acquired on Amazon: a “LCD Kuman 1602 v3”. 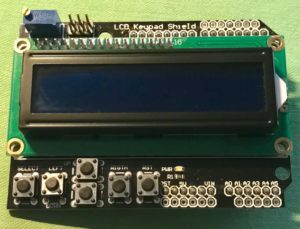 The shield is a clever little combination of a 2 lines / 16 characters LCD display and 5 buttons, that snap on top of an Arduino Uno, and makes for a nice little development platform. 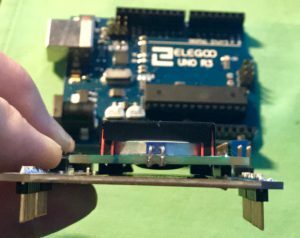 The student had tried various Arduino sketches, downloaded off from various places of the Internet and which ought to work – but, which didn’t, much to both his surprise and frustration. So we walked through it together, and (of course) got it to work – but, this walk-through revealed some easy-to-make misunderstandings from reading rand on publicly available tutorials. I thought I’d document those. 1602 is the model number for the LCD module – and, there are a ton of 1602 LCD modules out there – here’s an example of the specification of the 1602 LCD module (archived from https://www.openhacks.com/uploadsproductos/eone-1602a1.pdf). Fortunately, one doesn’t need to memorise (or, even, read) all this to use it: there’s a library for that which is one. Unfortunately, there’s a little more to it than just what’s in the specification. 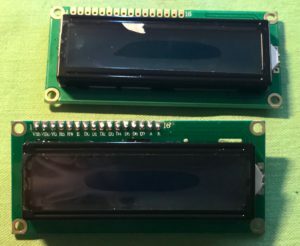 On the left below is a photo of two 1620 LCD modules I have laying around – they look pretty identical, right? However flipping them over, they look almost, but not quite, identical: one of them has a little red “board” riding on it. 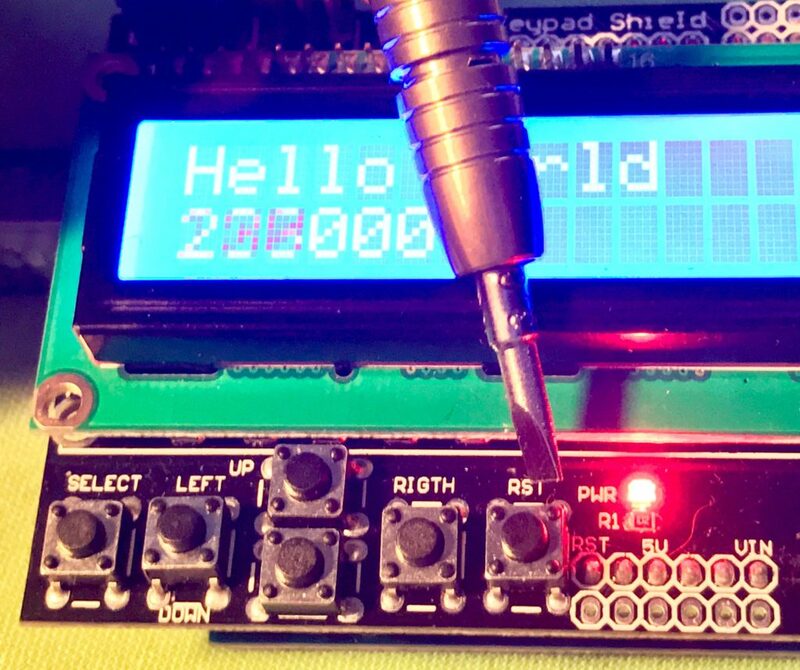 To simplify things, the “basic” 1602 LCD module has a “parallel interface” – meaning, that it requires the use of several of the digital pins (6, to be precise) of an Arduino board, plus of course power and ground. 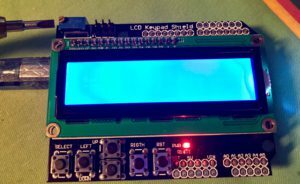 Some 1602 LCD modules do, however, come with “a little red board” pre-soldered on, which essentially is a parallel-to-serial converter. That’s pretty cool as it reduces the number of digital pins required from the Arduino board to just two (again, plus power and ground). 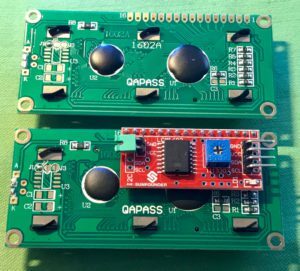 This is of course significant, since you’d use two different libraries when communicating with the LCD: either you use the LiquidCrystal library (for “parallel” 1602 LCD modules), or the LiquidCrystal_I2C library (for 1602 modules with a parallel-to-serial converter). And, just typing “1602 LCD Module Arduino” into a search engine will return sketches for either, often without much explanation. That did explain away why some of the sketches downloaded off the interned didn’t work. Thus, first thing: check if there’s a “little board on the back of the display” and pick library accordingly. 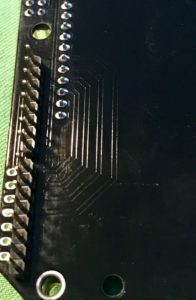 As shown on the picture, the LCD module is soldered onto a circuit board / shield – so the next step is to map the pin-out from the display module (typically, the display module will have labels printed on the pins on its header) and to the pins on the shield that connect to the Arduino. No other pins are connected – this is a 4-bit parallel display module. // i.e., the pins on the right column in the table above. // The second parameter is “Enable Signal"
//       the remaining parameters are the 4 digital pins forming the bus. 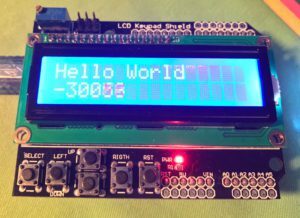 The Arduino reference will do a much better job at explaining the details of the various lcd.____ functions, than what I can do here. The little blue box on the top left of the shield (pointed to by the screw driver) is to blame. That’s a potentiometer (a variable resistor) used to adjust the display contrast. As a rule, they come “waaaaay turned down”, so there’s seemingly nothing displayed. (Oh, and do note the negative number in the picture, clearly the integer I counting up is overflowing nicely … ). 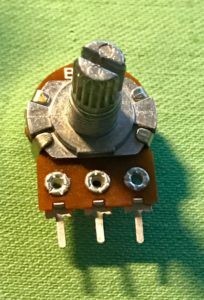 This is actually an (in my experience) inevitable source of first-timer-frustration: brashly giving a potentiometer 10 turns is not intuitive, especially as most potentiometers encountered are of this nature, which can be turned barely one turn (& as most beginners are trying to “be delicate”). This button is simply mapped to the RST button of the Arduino, and (expectedly) will reset the Arduino. (Honestly, while the symmetry may be esthetically pleasing, it really is not the cleverest interface design to put reset just next to the other buttons). Either way, this allows recording the values corresponding to a keypress. Given that this is an all-analog input, it may be that pressing the same key twice does not yield exactly the same value. 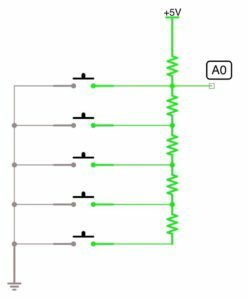 This may be because (for example) that resistor values change slightly depending on temperature, or slight variations in the power supply voltage, etc. … so it’s highly recommended to device an interval of values, for each given button. There is a very good reason for that: I tend to write functions so as to be able to embed #ifded-enabled code that writes stuff to the serial monitor just before returning – for debugging purposes. That’s a lot easier this way.